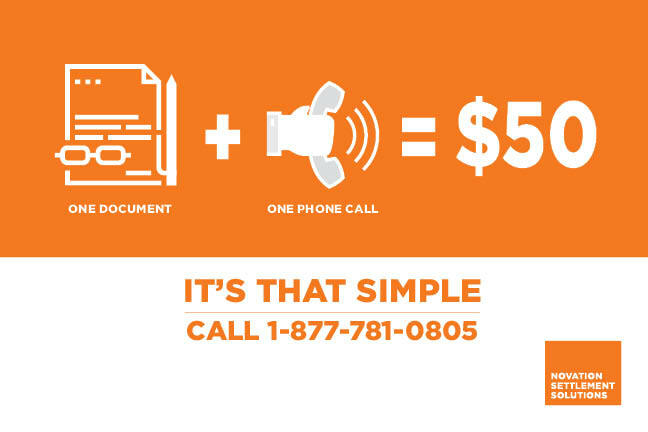 ﻿ One phone call gets you $50. Don’t have any copies? NO PROBLEM. Call us and we’ll arrange a conference call with your insurance company to get it. Get $50. But only for a limited time. and earn an easy $50. © 2017 Novation Settlement Solutions. This offer will only be awarded after you provide the specific required documentation. Failure to provide this documentation voids this offer in full. If the annuitant has already supplied any of these documents but the current remaining value is still unclear, a conference call with the insurer or a revised letter of benefits will be required to receive this offer. Novation is part of the Better Brands Alliance (BBA). The BBA is privately owned and operated by Novation Ventures, LLC. This offer is limited to one per person from any one BBA brand within a 90-day period from receipt. For a full listing of BBA brands, please visit betterbrandsalliance.com. Novation Ventures and its BBA companies reserve the right to cancel or change this offer at any time.